In 2017, the Reds will probablyÃ‚Â lose more games than they’ll win. I’m OK with that. Even though I hope to experience another Red October sooner rather than later, the past three years have reminded me that there’s still great joy to be had from losing seasons — I’d rather have bad baseball than no baseball at all, in other words — and I’m excited to see how the next six months will play out, regardless of the team’s final record. In contrast, I remember being a nervous wreck during the 2010, 2012 and 2013 seasons. Living on the West Coast, most Reds games began at 4 p.m. local time. I’m sure my productivity plummeted in the final hours of the weekdays on which the Reds played, but my Twitter usage certainly skyrocketed. From there, I’d monitor in-progress games during the slowdowns of my perpetually gridlocked commutes home; I’d receive angry glares from my wife as I scrolled for updates during dinner; and if they lost, I’d get upset and complain about whatever went wrong, which didn’t make me very fun to be around for about 45% of the season. Bottom line, I took things too personally, something I’ve tried to avoid doing over the past three years. 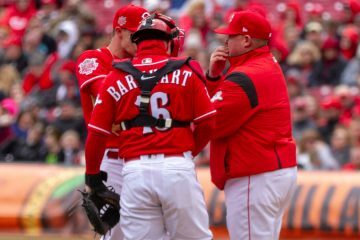 I still have room for improvement — bunting and peculiar bullpen management remain my Achilles’ heels — but if the Reds win, great. If not, that’s OK too. Don’t get me wrong — I always prefer the former scenario — but nowadays, I try to enjoy the journey regardless of the destination. Of course, we’d all love for the Reds to go 162-0. But what if they go 4-158? That won’t happen, of course, but I remember going winless during one of my final seasons of little league and enjoying the experience regardless. If you don’t have high expectations, it’s hard to end up feeling disappointed. With such a young roster, it’s inevitable that some players will underachieve. Others will experience painful situations both metaphorical (learning curves) and literal (injuries). Surely a handful of players will surprise us, though, just as Adam Duvall did last year. Whether it’s Robert Stephenson finally fulfilling his potential, Devin Mesoraco regaining his 2014 swing, or Bronson Arroyo schooling hitters half his age, there are multiple storylines in 2017 with potentially promising payoffs. One team will win. The otherÃ‚Â will lose. Either way, they’ll play again tomorrow. Don’t let what happened in yesterday’s game detract from how much you’ll enjoy today’s. I strongly believe that in life, it’s important to always have something to look forward to. That said, even on the roughest of mornings, I find it just a bit easier to get out of bed if I know the Reds will play that day. Off-days, much less the offseason, simply aren’t as much fun — and before we know it, the 2017 season will be over and we’ll be debating where Eugenio Suarez should play in 2018 instead of being able to watch him play like we can for the next six months. I imagine there will be plenty of empty seats at Great American Ball Park this year. While it’s exciting to be surrounded by a passionate sold-out crowd that echoes your own cheers, there’s also something to be said for the opportunity to sneak up a few rows and take in a better view. As things stand now, I’ll get to watch the Reds play in person just five or six times this year. I’m jealous of those of you who can see the team more often and who, unlike me, are used to being surrounded by fans wearing red when you do. Even if you can’t make all 81 home games this year, however, don’t discount the joy ofÃ‚Â being able to root, root, root for the Redlegs in person. Yes, if they don’t win, it’s a shame — but it’d be even more of a shame if that prospect keeps you away. Clay – +1 or perhaps +81 on point number 7. I’ve been a diehard Reds fan since 1972 and have never lived in Cincinnati. Atlanta now, Boston before that. We get to one weekend series a year in Cincinnati, plus (usually) a couple of games here against the Braves. Hardly enough to nourish me through a full season. 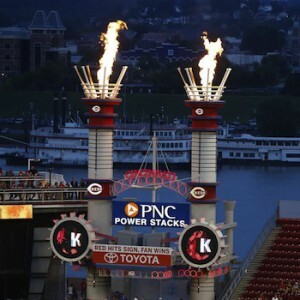 So to those of you loyal RLN types who are in or near Cincinnati – go to the games. Cheer. Cry. Eat. Drink. Pray. Cheer some more. Enjoy. I’m jealous and us out of owners are counting on you to make the most of your proximity to GABP. Wish I could be there in the next seat. Go Reds! Thanks for the comment. I seem to have struck a chord with my fellow long-distance fans! I hope you enjoy the games you’ll see this season. Everyone deserves to have their team win it all once, so I’m giving Cubs fans a one-year pass to enjoy their moment. Since I’ve never seen a game in either city, I’m curious — do you prefer watching behind enemy lines in Milwaukee or St. Louis? Can’t speak for the new Brewers stadium, but the couple times I went to the old County stadium back in the AL days, that was a friendly crowd. It’s Wisconsin, they tailgated for baseball even back in the 90s. Agree on #7. I’ve got about a 90 minute drive to Denver to see the Reds once a year. I’ve come close on several occasions to taking quick trips to Denver while the Reds just happen to be in town (ahem), but I’ve never pulled the trigger. Someday, hopefully. Will all these players be part of the next winning or contending team. I hope so cause if they are not this is going to be a long rebuild. I like to joke that if/when I leave Los Angeles, I’ll have to end up in another National League city — but you make a good point that I might want to consider an NL Central market if that city isn’t Cincy! I live in Milwaukee as well. Looking forward to going to at least one game while they’re in town in a couple weeks. 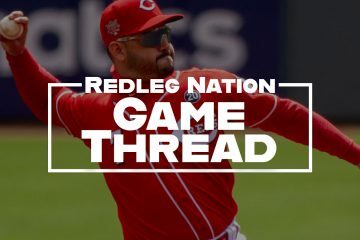 In the past its always been battle for last place in the division, but with Reds and Brewers both stocked up on young talent that may be changing very soon. Thanks for reading/sharing. It’s amazing how hard it used to be to watch or follow games when you didn’t live in a team’s home market. I’d hate to know how many hours I wasted as a child watching the ESPN ticker in hopes of getting a score update. Doesn’t happen too often but I’ll get to see the Reds at the Trop in June. Happy to hear it! I’ve driven past the Trop a few times but never made it inside. In fact, I think I’ve only seen games at two AL ballparks — Angel Stadium (where the Reds played for just the second time last year) and Fenway, where I caught a game back in high school. I too was encouraged by the second half of last year, but I feared this year’s starting rotation was paper-thin. The first week of the season was certainly cause for optimism, though. Here’s hoping the veterans won’t get too much playing time at the expense of the youngsters. I’m 100% with the sentiment………last year. I dunno, this first week has cemented my off-season expectations—that this team can flirt with .500, maybe more if some things fall into place sooner than expected like with the Cubs in 2015. Seeing the talent at the back end of the bullpen and the near all-star caliber reinforcements on the way plus a decent offense has me thinking .500 is entirely plausible. We just have to play better than expected for the next month until the cavalry arrives! Apologies if I seemed pessimistic while trying to write something that was supposed to be optimistic! I agree the Reds have the potential to surprise if they can bridge the gap between now and the returns of Bailey and Disco, but even if they don’t, I hope to enjoy this season just the same. Agree with everything. Playing with house money is the greatest. Well get a winner soon enough. Just moved to Portland so San Fran is the closest for me this year (no Mariners games) which probably isn’t happening. Pretty depressing. Thanks for reading! It’s never easy for me to get to Dodger Stadium on a weeknight, but that drive pales in comparison to your commute to Portland. I’ve still only seen a couple of games in San Francisco myself, one of which I’ll touch on in a future column. I’m not even sure I could stomach going to a game there after that 2012 series. They earned the spot of #2 most disliked team for me. Broke my heart when Cueto signed there. Clay, great tips. It takes effort to keep things in perspective with regards to our beloved Reds. Living in Hawaii makes it difficult to watch the Reds in person, thank goodness for MLB.TV. Usually plan a vacation to watch the Reds play every year, but haven’t done it the last few years. With Arroyo back (wife’s favorite player), she is planning a Reds trip somewhere this summer. Go Reds! Wow, Hawaii! I enjoy day games because they’re usually over by the time I have lunch here on the West Coast, but in your case, they’re probably nearly done by the time you wake up. Enjoy your upcoming vacation, and thanks for reading! Clay I feel you were and are being optimistic about this year’s team because you were spot on regarding your comments especially number 6.Its great to be able to look back and remember where you came from once you reach your goal. I’m trying my hardest not to be a stereotypical little league dad, and so far, so-so, I’d say. It’s harder during basketball (which isn’t his best sport) than baseball or soccer, though. The start of his baseball season corresponds with the start of the Reds’ season, which makes it easily my favorite time of the year. I definitely get where you’re coming from in #1, especially about playing for that winless little league team. Even when I was a little kid, I was a good ballplayer but during my 3rd grade season, at 8 years old, I broke my arm. It was a bad break. After the season was over my Knothole coach lied to my mom and told her that he wasn’t coaching the next year and that I’d need to find a new team. He told her that because he apparently wasn’t so sure I’d be a good player after the bad broken arm… So, we went to an open signup and I basically got assigned a team. The team was called “Plants Incorporated” and we were as close to “The Bad News Bears” as we could get. The team practiced in our coach’s relatively large back yard. We lost every game but it was still a really fun season. It was fun pulling for my teammates that weren’t good players and helping them become better. It was exciting when one of them made a nice play or got a hit. We went the whole season and we had one poor kid who didn’t get a hit the entire time. He only made contact a couple times. The losing was annoying to me at first but after I switched it around to just try to pick up and pull for my teammates, it was a lot of fun.